On Wednesday evening, August 8, 2018 DORA SCHRECENGOST left behind her worldly surroundings for a journey to eternal peace. Dora’s departure followed several years of declining health and confinement at Clarview Nursing and Rehabilitation Center in Sligo. Dora was born on September 16, 1919 to George and Susan (Loll) Weaver in Huefner, Pennsylvania. Dora was the longest living of the 7 children in the family. All siblings as well as their spouses have been deceased for some period of time. Dora married Raymond Schrecengost on July 24, 1940 at St. Michaels Catholic Church in Fryburg. In this same church Father Theobald, baptized Dora in 1919, Conferred the sacrament of First Communion on May 27, 1927 as well as the wedding ceremony. Dora was life- long member of St. Michaels Church. In the past five years as a resident of Clarview Nursing and Rehabilitation Center, Father Monty Sayers of Immaculate Conception Church in Clarion has ministered to her faith needs. Ray died in June , 2008 following a brief illness. Dora and Ray were the parents of nine children including three sets of twins. As time passed, these nine added 8 spouses, 19 grandchildren, 27 great grandchildren, and 3 great-great grandchildren. The children were raised with love, discipline, faith and hard work. An unspoken mantra was…be practical…be proud,…and …be not too full of yourself. 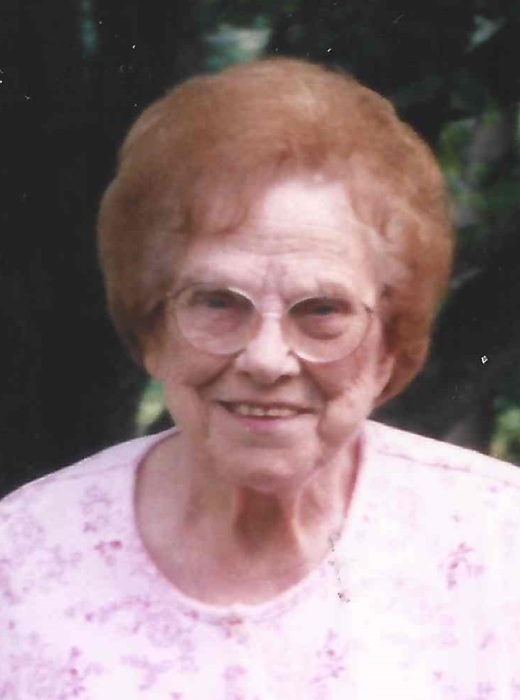 Most of all, her commitment to her faith and to God has been demonstrated over all 98 years of her life in the way she raised her family and active membership in the parish. Beyond the sadness of losing Dora, a celebration of her life is cherished by her descendants. Dora lived a life full of many accomplishments that receive rewards in the heart, not on the mantle for display. There have also been some losses along the way, definitely, the death of her life partner and later the total loss of hearing since being a resident at Clarview. The nursing home experience created the loss of independence and a new definition of dignity that hopefully has not been as painful to her as much as to her family. The many blessings of Dora’s life includes many survivors, her 9 children and 6 spouses are: Cathy Schrecengost; Yvonne Perry; Raymond (Mary) Schrecengost; Gerald (Cathy) Schrecengost; Dennis (Bonnie) Schrecengost; Deborah (Curt) Boyles; Lenny (Ann) Schrecengost; Linda Swab; Steven (Kate) Schrecengost. Two sons-in-law are deceased: Ronald Perry and Thomas Swab. 19 Grandchildren and 15 spouses survive: Kim (Mick) Griffith, Missy (Greg) Fetzer, Rhonda (Randy) Shook; Raymond Schrecengost, Kurt Schrecengost; Dawn (Rob) West, Gerri (Bill) Bryner, Jim (Karen) Schrecengost; Lori (Ken ) Hahn, Randy (Kate) Schrecengost; Tony (Shari) Boyles, Scott (Ashley) Boyles; Jeromy (Sara) Schrecengost, Andy (Jen) Schrecengost, Brian, (Lisa) Schrecengost; Chris (Erin) Swab, Cybill (Justin) Reed; Zac Schrecengost, Drazen Schrecengost. 27 Great Grandchildren survive: Corey and Abby Griffith; Lindsay and Maya Shook; Matt Schrecengost; Courtney and Brandon Schultz, Derek and Justin Bryner, Jimmy, Danny, Donna, Angela and Tabby Schrecengost; Gabby and Naomi Hahn, Nora and Sam Schrecengost; Gavin and Ian Boyles, Eva Boyles; Lauren and Jarrett Schrecengost, Bradley and Grace Schrecengost; Ella and Dean Swab. 3 Great-Great Grandchildren: Chase, Brice, and Brantlley Bryner. Siblings preceding her in death were: Edward (Dorothy) Weaver, Lawrence (Francis) Weaver, Roy (Marie) Weaver, Marie (Bernard) Schmader, Bernard (Mercedes) Weaver, Rita (Dennis) Schmader. Likewise all in-law siblings are deceased. They were: Harold (Georgie) Schrecengost, Edna (Mike) Hubauer, Russell (Mary) Schrecengost, Arnold (Helen) Schrecengost, Geraldine (John) Wilshire, Ethyl (Bob) Walters, Annabelle (Cleon) Mock. Many nieces and nephews are surviving. Funeral arrangements are being handled by Faller’s Funeral Home in Fryburg, Pennsylvania. Visitation will be held on Sunday, August 12, 2018 from 3pm to 7pm. Mass of a Christian burial will be celebrated at 1PM on Monday, August 13, 2018 at St. Michael Church in Fryburg with Rev Joseph Czkarowski pastor of St. Michael Church as celebrant and Rev. Monty Sayers as co-celebrant. Interment will be in the St. Michael Cemetery following the Mass. Please visit www.fallerfuneralhome.com to share you memories and photos and offer your condolences.